A confirmed source informed me that demonstrations started in the Souq el-Jumaa area two days ago but thugs stopped it quickly so that no one would notice it. Qaddafi supporters spread rumours that Ajdabiya is now under Qaddafi’s forces’ control. Saif al-Qaddafi promised his delusional backers that things would end in less than 2 days from March 14th and that by this Friday (18th March) he would be praying in Benghazi. All this propaganda and false information is made up in Tripoli to confuse, scare and convince Qaddafi’s kids (the ones he takes from primary schools and shelters) with lots of songs in the streets, dancing and cars carrying his filthy flag. Qaddafi sees every Friday as a nightmare, and he has to make Thursdays so frightening and scary for the Libyans by increasing the threats and intimidation. Friday 18th March was the day I reluctantly left my beloved Libya. On our way to the airport we had to pass through checkpoints where Qaddafi’s forces stop cars, stare closely at each face with their evil eyes, and search the car. I heard that every time they stop cars to search the trunks, people get out of their car and watch the process, because Qaddafi’s forces may plant any weapon and then alert the next checkpoint to catch it (a con and an evil way to show they are doing their boring job and catching armed people). The worst part was when we were forced to park our car quarter of a mile from the airport car park and to carry our luggage all that way to the door of the airport. They had no respect for anyone. Even when they saw elderly people they insisted that no car would enter the car park except the thugs and some regime VIPs. Entering the airport, I was shocked by the horrible smell and the unbelievable amounts of dirt and garbage all around. Many people had put up tents and were camping until they could catch a plane back to their homes. The scene was horrible, and the moment I picked up my camera to take pictures, Qaddafi’s forces immediately ran towards us and asked a member of my family: where is this girl from? And why is she using her camera? When I said I was Libyan, they said: Okay, hide your camera now or we will take it away. Unfortunately I couldn’t take pictures to show the horrifying scenes of people spending nights outside the airport. When I entered the airport I expected it to be unbelievably crowded, but it was completely empty. No flights and no airlines were working. My flight was the last one. Most people who used to work at the airport had been replaced by people who belong to the battalion of Khamis (one of Qaddafi’s brutal sons- and the worst of all his sons when it comes to killing innocent civilians). I heard that they don’t allow Libyans to leave easily, and indeed, before I left the country, they asked why I was leaving and where I was going, what I had been doing in Libya and what I was going to do in Morocco. They also took my name and gave it to somebody to check it. I waited for about 30 minutes until that source called back to give the OK for me to leave. That was a regular procedure they did with every Libyan leaving the country. Libyans, we know for a fact that Qaddafi hires only bloodthirsty killers with no brains, because he always fears smart people. On the plane, there were many reporters leaving the country. And minutes before it took off, a Libyan plane belonging to Libyan National Airlines landed. A red carpet was laid in front of the plane, and all the people who disembarked were wearing Gulf outfits. I can’t guess who they were and what they were coming to Libya for at that very critical time when the Security Council was a very few hours away from passing the no-fly zone resolution. Based on the last updates that I received from my friends inside Libya, the internet is still completely blocked (almost a month now). And just hours ago a source confirmed to me that most lphone lines have been cut in Tripoli. Only some numbers from the Libyana phone operator (+ 218 92….) seem to be working, and international lines are tough to come by. 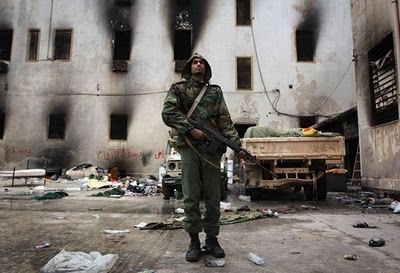 Also the phone service has been completely blocked in Benghazi since Thursday 18th March, when Qaddafi’s forces brutally attacked some of Benghazi’s areas and missiles hit, as well as tens of adults, a bedroom of 2 kids (one around five years old). Both are still in intensive care. Today, Wednesday March 22nd, Qaddafi’s thugs murdered 5 kids ( shot in the head) after the security council ordered him to cease fire, but it seems Qaddafi can’t put his head on a pillow at the end of the day if he doesn’t make sure he murders innocent Libyan citizens and as many kids as he can. My husband is in benghazi, I have not heard anything from him in one week, we were talking everynight on mobile.. Do you know if the mobile network is still down ?